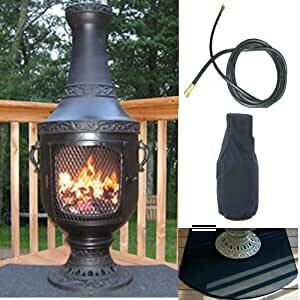 The Venetian Style Gas Chiminea is a highly functional chiminea outdoor fireplace design that is a crowd pleaser. This is the same as our wood burning Venetian outdoor fireplace with the convenience of gas design included. Designed of heavy non-rusting Cast Aluminum Alloy with stainless steel components, it will not rust and has very little maintenance. The gas conversion includes a set of 7 high quality ceramic logs and a free Year Around cover to protect your chiminea when not in use. Gas conversion can be removed for regular wood fires and put back in for gas convenience. Due to different natural gas configurations, we suggest contacting your local gas installer for natural gas installations. Propane installations can hook directly to propane tank or grill. Assembled Weight: 94 lbs.Shipping Weight: 97.00 lbs.